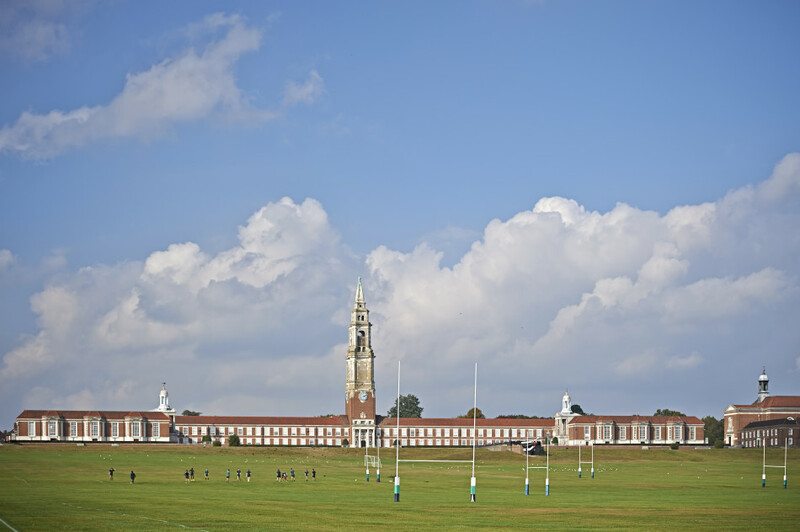 Navigating Success is the motto that The Royal Hospital School in Suffolk operates on. Whilst it is a nod to their naval heritage it can be aptly applied to the grounds department, led by Grounds Manager Steve Mutton. Blair Ferguson reports. Steve Mutton's challenge is to provide high-quality sports fields for the 740 children aged between eleven and eighteen years old who use the school - 450 of which stay on site - and the hundreds more who use the pitches during lettings and the Minor Counties Cricket Festival. The attraction of the school is easy to understand. 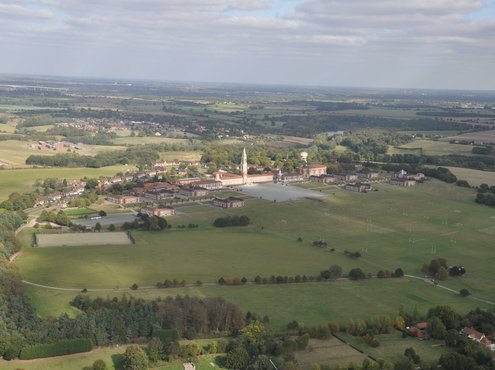 The sheer size of the 200-acre site is summed up when you learn it has its own postcode. 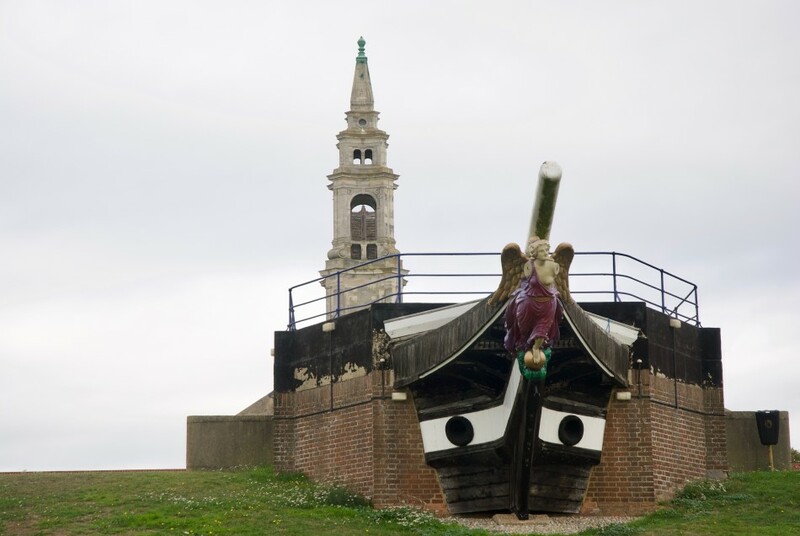 Sculpted into the Suffolk countryside, overlooking the river Stour, it boasts a rich naval heritage and was originally founded in 1712 and located in Greenwich, London, before it moved to its breathtaking Suffolk landscape. 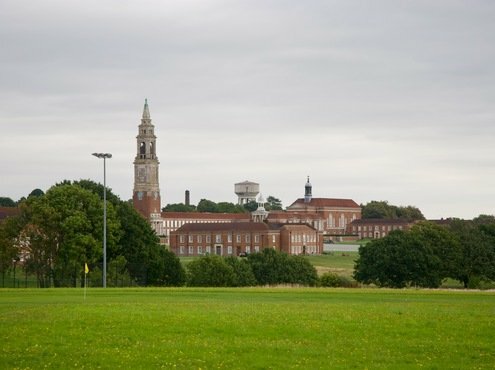 The site was built with military symmetry, with the aim of being completely self-sufficient, and contains the main block, twelve boarding houses, fifty-seven residences, a chapel, medical centre, water treatment plant, sewage treatment works and an unused morgue. The main reception is home to several pieces of naval and school history and is the place where I met Steve before commandeering a John Deere Gator. We drove to the back of the main building onto the balcony that overlooks the parade ground - on this occasion complete with a military helicopter for the visit of the Second Sea Lord of the Royal Navy, Tony Radakin - the main sports field and nine-hole golf course. Steve maintains this varied site with the help of his six staff and the area they cover is vast. 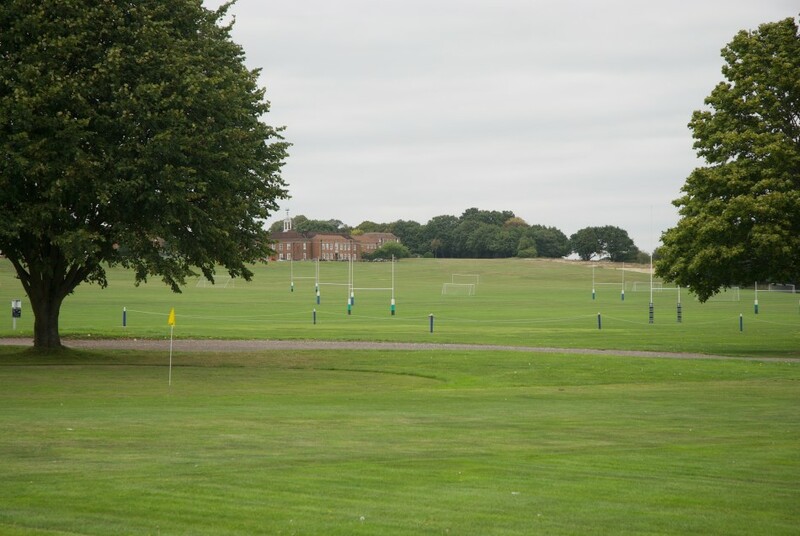 The winter programme requires nine rugby pitches, six 11-a-side football pitches, two grass and one artificial pitch for hockey, a nine-hole golf course, and a hard court which hosts six tennis courts and six netball courts. During summer, the five grass cricket squares, containing thirty-eight wickets, get extensively used and, on a Saturday, can host up to eight games. With a modest number of staff, priorities have to be made with an uncompromising schedule of sport, lettings and events to facilitate. "After the cricket festival, we had about a week where we had to get two rugby pitches up and running for a new let," Steve explained. "There is a constant flow of lets over the summer period, usually consisting of cricket and football, but this year we had the addition of rugby." "The cricket festival is made up of twelve teams who play a fifty-over format that lasts eleven days and consists of two five-day tournaments for under-11s and under-12s, with a one-day gap. It's an important event for the school, as cricket is one of our two main sports." This year, Steve's team had a gap of about a week between the last cricket let and the new rugby let. 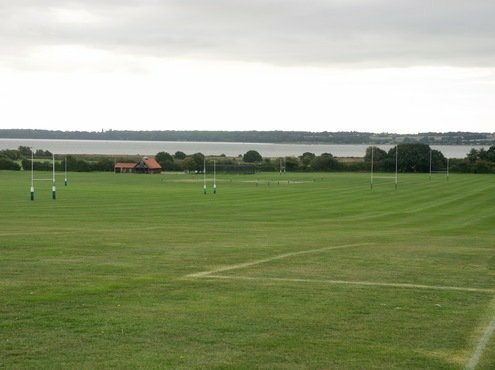 From then until Christmas, all of the nine rugby pitches will be in use and he's unable to renovate during this time because the schedule doesn't allow time for it. "After Christmas, a majority of the rugby pitches come down, leaving two pitches for cup games and general training, which means our work on the pitches is then only limited by the weather. The football pitches are the main areas that don't get the chance to be rested, as they are constantly used by the lets and by pupils in both internal competition and general recreation." "I think that lettings are important in any school now, and the RHS is no exception. The cricket letting is very significant as it adds to the profile of the school. I think it's a nice thing to have and you get a lot of satisfaction from seeing the kids out there, who not only enjoy the cricket facilities but also their stay on site." "Because of these activities, there's never a time when there's nothing happening on the pitches. There's still work you can do if the conditions are right, like aerating, which for any grounds team is important. The October and February half term allow up to three weeks where the main sports field is free of lettings, so mechanical work can be carried out, weather permitting." "Due to the needs of the school and having to work to time constraints, we've reluctantly had to push certain processes to one side. We have managed, so far, to get away with it, but we are always aware that this isn't sustainable." "Being a multi-sport site has its unique challenges. Apart from hosting sports lettings and cross country events, the two dominant sports for the pupils are, as you would expect, cricket and rugby. "We're lucky that these two sports take place in different seasons; if they were in the same season then that would make things very interesting." "I can't see there being a significant change in priority concerning our key sports. But it would be a mistake to assume that this would never happen. It's something I have no control over but, if it did happen, then I would like to think that our team would embrace the new challenges." "We are a big site, but are operating at full capacity, and there's not much space that isn't used. Including the nine-hole golf course we've got ninety-two acres of recreational area, plus the main school area with all of its intricacies, so there is a lot going on." "The cricket areas are intensively managed and there is always a desire to improve the five cricket squares. Any gradual improvements here will be built upon year after year: success is gauged when we improve the surface consistency without sacrificing the other aspects of turf management." The topography of the site poses its own particular challenges, with the majority of the sports pitches sitting on a long north-to-south slope. This non-uniform landscape has its pros and cons, and the management techniques employed may differ from those traditionally taught. Steve has learnt how areas react to seasonal changes and extreme weather events, through his own experience, and by consulting his long-serving staff. In his Assistant Head, Alan Hinton and staff Joseph Wicko, Izabelle Tooley, Claire Hayes, Andre Taylor and Stephen Milbourne, there is a wealth of experience, expertise and enthusiasm to call upon on. These factors are all vital in the smooth running and operation of a site that can present challenges. That knowledge was crucial during a year that has seen record high and low temperatures, with the impact of one season carrying over to the next. The slope at the RHS proved invaluable during the hotter weather, with the soil structure also assisting. The same couldn't quite be said during the colder months when new ideas had to be trialled. An example of this is verti-draining their cricket wickets. Initially, it wasn't possible to do so because the surface was too soft and tender, but this led Steve to discuss possible options with a contractor, and they decided it was worth trying to verti-drain when the next hard frost occurred. It worked, and this approach will be used if required in future years. "I wouldn't go out and advise other people to do the same thing," Steve said. "But, for our site, with its unique ground conditions, it was the right solution." "By sheer quirk of location, what we haven't got in terms of flatness we gain in other ways. The field drains very well in some areas better than others. 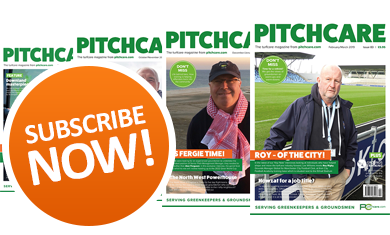 The bottom of the field has lush, verdant growth for most of the year, whereas the top pitches suffer from ground movement and will show up turf weaknesses during dry periods." "We're looking towards getting that manageable mechanical programme which we can implement little and often, and any form of regular aeration will be beneficial in the long run. Our Charterhouse slitter does a basic job, but regular verti-draining is the key. In conjunction with aeration practices, I would love to have an all-singing, all-dancing seed and fertiliser programme in place, but that isn't top of the priority list. I'd like to establish continuity before then." "We would like to expand the practice of verti-draining to the main winter pitches and the main cricket outfield. As the dynamics and requirements of the school change, we'd like to invest in our own machine, which will enable us to be more flexible and ultimately self-sufficient." "The soil profile here is a mixture. From my college days, I'd say it's almost like a glacial till. It's an amalgamation of sand, silt and clay all churned together, so it doesn't have a uniform soil structure. There is definitely compaction in certain areas, but the natural slope helps relieve excess water from the site." 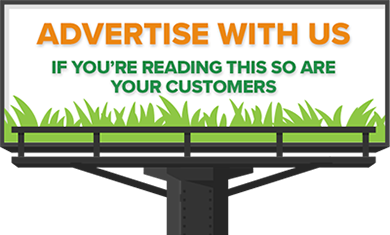 "The site has quirky characteristics and, if you adopted our working practices at a less agreeable site, then you could be in real trouble. When we experienced the drought conditions this summer, you could see everything starting to brown, moving slowly, as the weeks progressed, from the top of the field to the bottom. The effect of the drought was reduced by the fact that we'd had a very wet spring. It shows that the soil can retain the moisture, so that was a big positive. In sandier soils, the impact of the drought would have been far greater." "This year, we had excessive cold, wet weather in the spring, which meant that, even if we could have worked on the cricket squares for pre-season preparation, we couldn't physically get to them with the machinery because the ground was too soft. However, a week later, with drying easterly winds, we could reach the squares but the surface was too dry to carry out successful rolling. It's a constant battle." It's clear from the early conversation as we travelled around the site that Steve came to the school not only for the challenge but also for the potential. In his younger years, he played at Cromer Lawn Tennis and Squash Club in Norfolk, and it was there that his initial love for tennis started, as a five-year-old. The club was the place that would shape his career. He began to help the groundsman during the first year of his GCSEs, and that sparked his interest in the trade. He continued to assist during holidays, up to the end of his Environmental Policy degree which he completed at Gloucester University. The methodical approach of renovation captured his imagination, as Steve puts it, "constructively destroying the turf surface, and having faith that nature would take its course". After university, Steve took on some middle management jobs outside of turfcare. 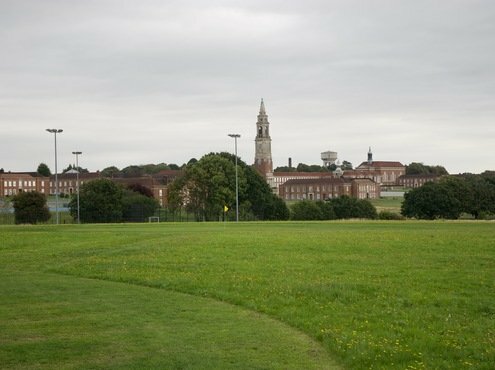 He welcomed the opportunity to return to Cromer to take on the role of groundsman at the club, where he completed his NVQs in turf. After two years, he joined Collier Turf Care as a technical sales rep. During his five years at Colliers, he gained confidence and knowledge of the industry, becoming a FACTS and BASIS-qualified advisor. When the position of Grounds Manager at the School was advertised, Steve felt it was time to apply these skills in a new environment, and ultimately make changes for the good. This has involved embarking on environmental projects that benefit flora and fauna across the site. 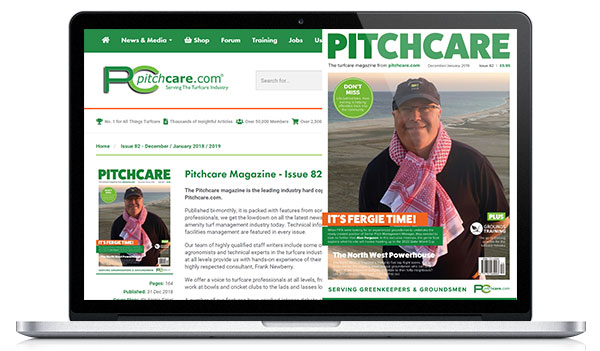 "One of the reasons I got into the industry is that I saw the benefit, environmentally, ethically and financially, of a holistic approach to turf and grounds management," he said. "For me, sustainable development is making sure we meet the needs of the school today, financially and environmentally, without compromising our ability to do so in the future. There is never going to be a single way of achieving a solution, and I've tried to adopt an open mind when addressing challenges." "We had sightings of turtle doves around the grounds, and as they require a specific environment in order to thrive, the Estates Manager was clear that he wanted to develop further habitats for these birds on site. However, the business and operational needs of the school are ultimately our main focus and, in prioritising these needs, the turtle dove programme, unfortunately, couldn't be addressed as fully as we would have liked. The result was frustrating for all concerned and, under different circumstances, we could have achieved a more positive outcome." "However, this small setback should not discourage us from future projects. We are looking to improve the quality of the rough on the golf course, where the turtle dove project was based, and from there we can assess whether it's worth making a second attempt or to look towards encouraging more wildflowers, which can benefit other wildlife." "It's important to be environmentally aware, and to have turtle doves on site would be fantastic, but they require a very niche habitat. If we want to encourage successful environmental projects, then maybe we should aim for more achievable targets. Small successes in these areas will help cement environmental awareness as part of the school's DNA." "Environmentally, across the site, I'd like to keep it simple for the next couple of years. Tree and gorse-planting in and around the golf course is a priority, alongside continued management of the existing gorse habitat. The golf course rough is harvested for hay; this practice is carried out by enthusiastic groundstaff in their own time, using a drum mower, haybob and a vintage baler. The golfers would prefer the rough to be a lot shorter, but we believe that the benefits to wildlife from having it longer override any short-term golfing inconveniences." The constant time constraints and pressure to deliver aren't helped by the low levels of staffing compared with the size of the site. Mowing a sports field using a Trimax Pegasus can take a day at best and, during the growing season, this needs be carried out two to three times a week. Steve explains: "In addition to this, on any one day during the summer term you might have two people on the cricket outfields and athletics track, another on a cylinder mower cutting the cricket squares and wickets, and someone else rolling the cricket wickets. So, at key times, you can easily lose five people on the sports pitches and, for us, that's the majority of the staff!" "Looking towards the future, as someone moves on or retires, plans to replace and increase staff numbers are in place, as are strategies to further train staff in sports field and artificial surface maintenance. An artificial hockey pitch upgrade is being looked at, but as yet has no fixed date for completion." Change occurs in all industries, and Steve believes in the importance of training his staff to address the challenges brought about by change. This can range from a day course to more academic qualifications, both of which can give people more experience and confidence in their work. Certain frustrations show when talking about the government's apprenticeship scheme because there are no direct routes into groundsmanship, something which Steve feels the IOG could do more to promote. Recruiting staff can be difficult for anyone, but when you're based in a secluded location, away from any major talent pools, it can be even more difficult. However, the main requirement for Steve is enthusiasm and a genuine desire to do a good job. An ongoing issue within the industry is the stark lack of women within grounds teams. The Royal Hospital School has two women in their ranks: Izabelle and Claire. And while Steve doesn't want to single them out purely because of their gender, he does use the case of Izabelle to highlight his philosophy. "We want to encourage the development of good workers, regardless of their gender, but don't want to make someone a token figurehead. In the case of Izabelle, she applies her enthusiasm to all aspects of her work, she is strong on the practical side and very good at dealing with people. As she progresses within the industry, there will be new challenges that she will find difficult. But challenges can be overcome with hard work and application." "My aim is to get to a sustainable level where we can produce a consistent product. The next person we're looking for needs to be experienced. However, as people retire or move to other jobs we'd look at training someone. The risk is that, after two or three years of training, they move on, but even if this happens, the school should benefit from the employees' improving skill base and working standards. Forming and maintaining an effective team that meets the demands of the school is one of the biggest challenges faced by anyone in my position." Going forward, Steve hopes to use the experience and enthusiasm of his current staff in conjunction with contractors to prioritise non-sports areas of the site. It's easy to forget the high volume of grass edging, flower beds, shrubs and gravel drives that are across the site as well as the 55 on-site residences. 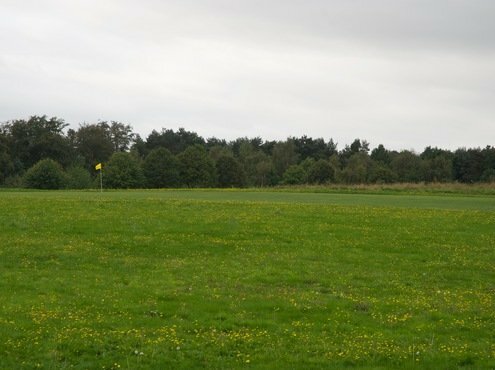 These areas are additional pressures alongside providing sports pitches, but the priority is "raising the level of acceptable" across the site in a realistic and achievable way. "This year, we've started to look at raising our base level of standard quality across the site, in what has been a very tricky year with the prolonged periods of extreme weather," Steve explained. "The sports fields are the priority, but it is one of many. 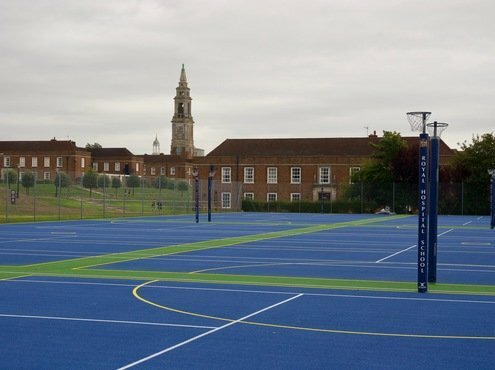 Students need to be taught on pitches and to have areas of recreation as well, so I see the sports pitches as classrooms which are also used both before and after the academic day." For Steve, working closely with the Director of Sport and Estates Manager is important when trying to focus on determining key objectives with the ultimate aim of sustainable improvements. He is looking for continuity in the form of a development strategy so that improvements can be made in the short, medium and long-term. "Having a plan for the next five years and beyond is important. The scale of the site means that not everything can be improved through one initiative." "Hopefully, in the near future, you will see the early stages of a tree-planting programme, and the golf course will have been developed through a combination of improved greens quality and gorse planting. 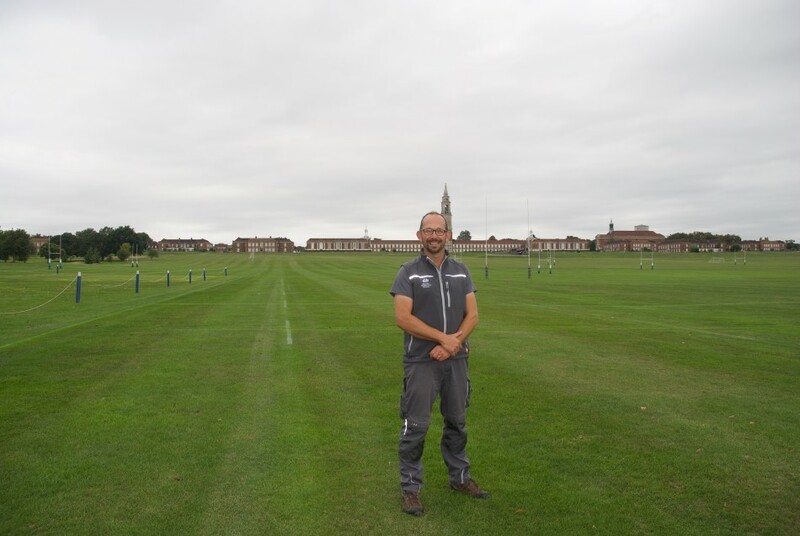 The principal rugby pitches will have benefitted from mechanical work to improve the surface levels as well as an overall better sward density." 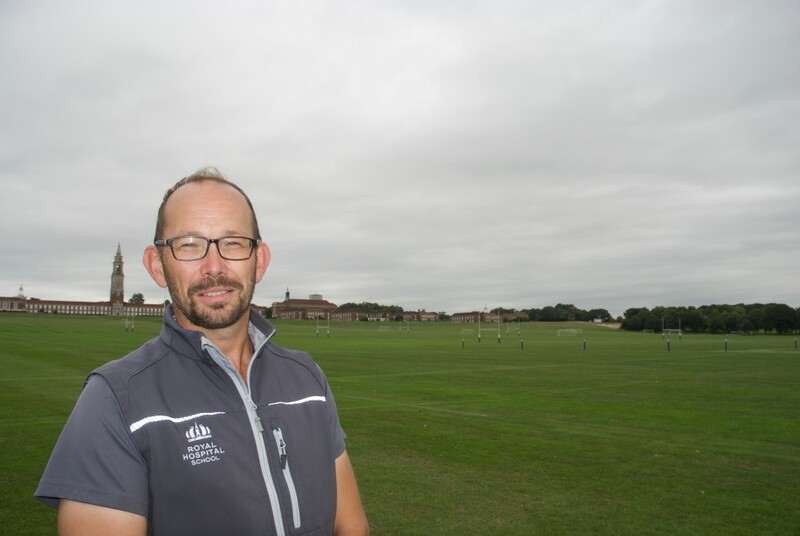 "In five years' time I believe turf quality standards will have been improved at the front of the school, and there will be cricket outfield and rugby pitch improvement on the main areas, I'd anticipate we'd be contracting out a renovation programme on a two/ three-year cycle." "We could give the municipal areas a bit more purpose and make better use of them, as they are closer to the school than the sports field. I'd imagine that the surface would still be turf. Because of our location we have to be careful about where we locate hardstanding areas - planning permission would be required. However, all options should be considered if progress is to be made." "Other things might be simplified, like a reduced number of flower borders in areas of low footfall. These areas can be rationalised yet, at the same time, we don't want to make the site sterile. Generally, I want to raise the bar across the site, so that on our worst day we have an acceptable level of landscape management through sustainable improvements." The Royal Hospital School (usually shortened to 'RHS') is one of the UK's leading independent boarding and day schools providing a full and broad education, enriched by a unique naval heritage. The school is located in the village of Holbrook, near Ipswich. 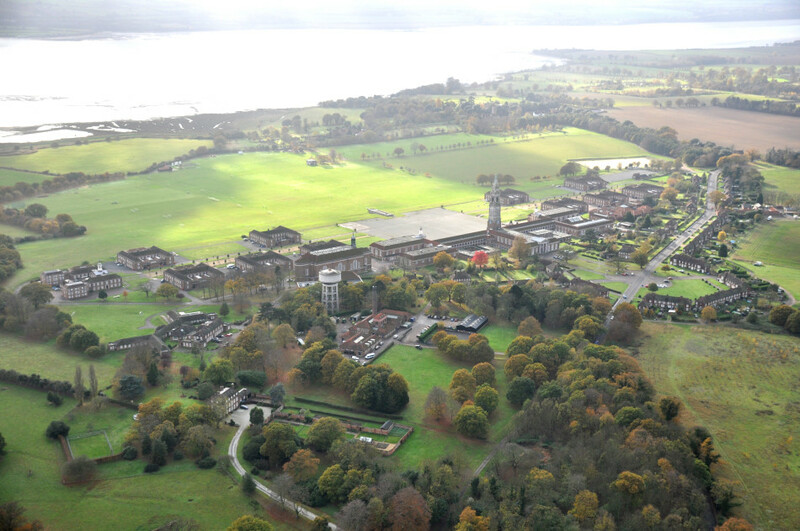 The school's campus is of Queen Anne style and set in 200 acres of countryside overlooking the River Stour on the Shotley Peninsula in an area known as Constable Country. The Royal Hospital School was established by a Royal Charter in 1712. It was originally located in Greenwich, London, in the buildings that now house the National Maritime Museum, but moved to East Anglia in 1933. It is the only UK independent boarding school to have ever been continuously granted the Queen's Banner and it flies its own Admiralty-approved Royal Hospital School Blue Ensign. It is one of only two UK schools whose students have the privilege of wearing Royal Navy uniforms, the other being Pangbourne College in Berkshire. 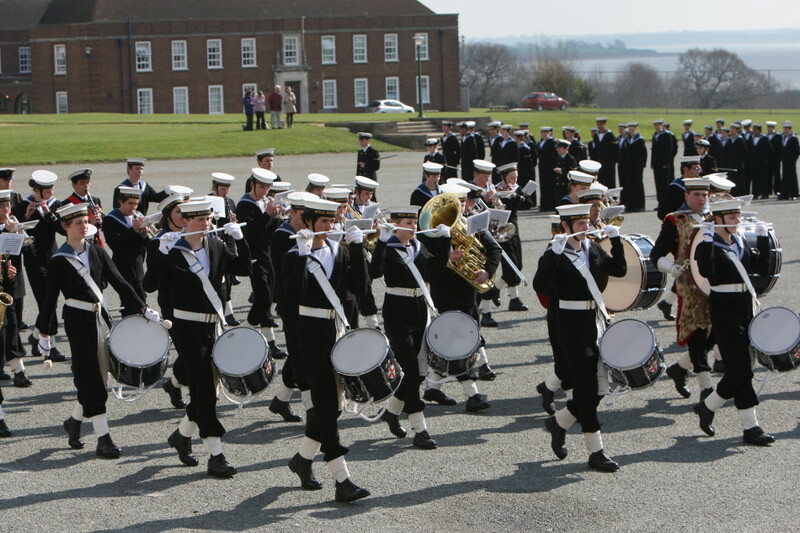 Seafaring traditions are important and integral elements of school life and Royal Navy uniforms (sailor's suits) are issued to all pupils and used for ceremonial and formal events. The school is owned by the Crown naval charity, Greenwich Hospital and, as a result, provides a number of means-tested bursaries for families with a seafaring background. Leadership development is another distinctive feature of the Royal Hospital School derived from the naval background. Army, Royal Navy, Royal Air Force and Royal Marines Combined Cadet Force, along with the Duke of Edinburgh's Award Scheme, are the most popular extracurricular activities at the Royal Hospital School. The Combined Cadet Force also includes a Royal Electrical and Mechanical Engineers Section. HMS Dauntless is affiliated with the Royal Navy CCF. The Army Section is affiliated with Army Air Corps.